My river sandals grip into a slanting block of smooth granite. I peek into the gut of Black Creek Rapid. My own gut turns. In this steep canyon, the Salmon River (in true Idaho rapid fashion), pours off the lip of a quiet, flat pool into ten seconds of utter whitewater chaos. A quarter mile later, the river is smooth again, the drop a faint memory painted in bubble lines. Today, in the center of Black Creek, a single oar is stuck vertically, thrumming with the water pressure. “How did that even GET there?” I question the guide standing next to me. A decade ago, boaters passed the narrow Black Creek side canyon with barely a glance. Salmon Falls, a half mile upstream, was a far bigger challenge—an iconic drop that tortured historic river runners from wooden scows to jet boats to rafters. As a kid I stood on the opposite shore, sandals gripped into granite, nervously scouting my line through the narrow shoot of the falls. Rivers are dynamic, however, changing overnight in response to rain, runoff, slides and the general gravity of geology and weather. 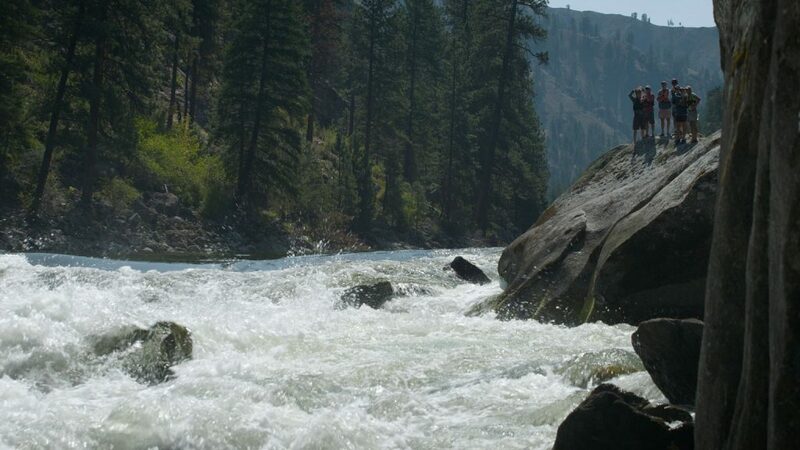 On the Salmon River, many of our rapids are named after creeks because the drops are formed by debris pushed into the river from steep tributaries. In the spring of 2011, a warm weather front hit the snow covered Salmon Mountains resulting in a rain event and massive debris flow down Black Creek into the main stem of the Salmon River. That season’s spring high water pulse pushed the dangerous log jam and much of the debris downstream but the rapid continues to evolve even a half-decade later. The large guard rocks of Salmon Falls are now riffles under the surface of the slack water the earthen dam created. 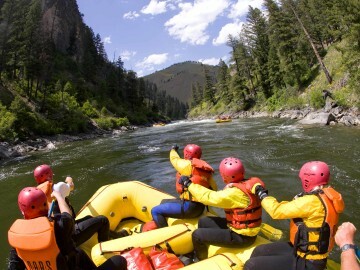 As our boats slide over the submerged boulders of the old rapid we begin to hear the roar of the new one. In each year since Black Creek Rapid formed, the boulders and rocks of the rapid have shifted. The Salmon, being an undammed river, often swells to 7-10 times its normal size as snow melts out of the mountains of the Frank Church Wilderness. This surge of water realigns the river bed and the obstacles throughout the rapid. As guides, we scout Black Creek every trip, never sure how the hydraulics have changed. A center line involves a tricky set up to rival Black Creek’s predecessor, Salmon Falls. The consequences of missing the entrance move are a set of churning, boat-flipping hydraulics on one side and a sharp rock island on the other. More than one 18-foot raft has been stood on its side in the hydraulics and the boulder-choked island has munched a dory or two. 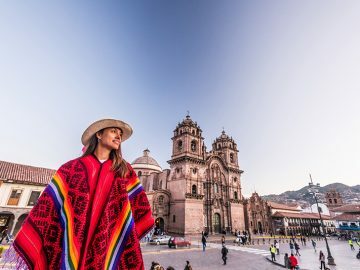 How about the other run? The river left line is a solid wash of whitewater from the lip of the pool to the tail waves below. The current line pushes into a set of sharp lateral waves, then is lost in a surging eddy bouncing off the bank. Following the path of the water, it appears your boat will be wrecked sideways into a rooster tailing wave/rock. I tease her about portaging instead but she’s right. 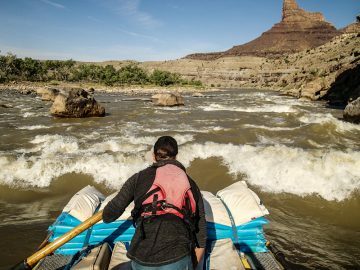 My heart pounding (yup, even your guide gets nervous sometimes—it signals a healthy respect for the water), I slowly row my boat up to the precipice of the left side of the river. I place an oar stroke into the face of the first wave, correct my alignment into the second and a few moments later we’re hitting the big, surging tail waves. The current has perfectly cradled our boat through the s-turn of current. 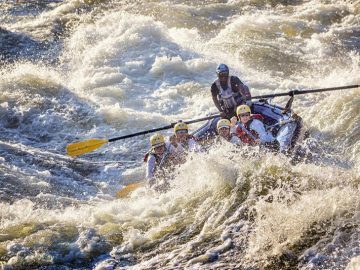 I eddy out and watch the rest of our crew row and paddle through, sunlight refracting off the river as waves explode around the bow of each boat. Black Creek is my favorite type of rapid to guide—a little scary, a loud roar, easier than it first appears and big, roller coaster waves throughout. 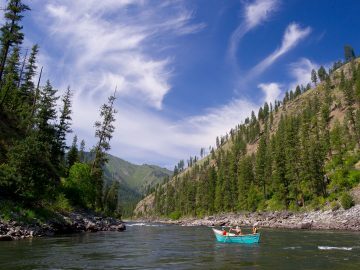 Guides love the Salmon River because, due to it’s free-flowing nature, each week the rapids are run a little differently. Because the river has a natural seasonal fluctuation, it’s rare to ever hit a rapid at the exact same flow. Rapids like Black Creek also remind us that the canyon itself is a wild, changing landscape. All it takes is a heavy rainstorm, a forest fire or a fallen snag to completely change the way we approach a stretch of water. 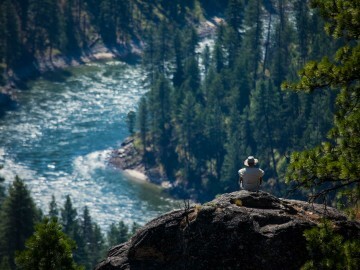 As guides, Black Creek keeps us on the toes of our river sandals…right where we like to be.